I saw a photo of my co-worker's kids reading to one another. I decided I wanted the boy's next shot to be somewhat like that. I brought to Picture People 2 big totes filled with books and one outfit change. Yes I have a lot of books! It was raining like cats and dogs. I was so worried everything would get wet. I knew when the photographer got out the ladder, that I'd probably like a pose from that setting best. You don't see tons of books, but you get the idea. There were tons of them! The ones seen are Cloudy With a Chance of Meatballs, In the Night Kitchen, If You Give a Cat a Cupcake and Tessa the Teacher. Mica's now reading full children's books to us. Isaak loves to get read to! I got their outfits at Gymboree. Isaak's hair is so fussy! Mica's supporting his cool hat! It can be hung different ways. This is the way I decided to hang it. It's not matted with these colors, although I wish it was. That was done in Photoshop. Fantastic shot! Your boys are adorable. 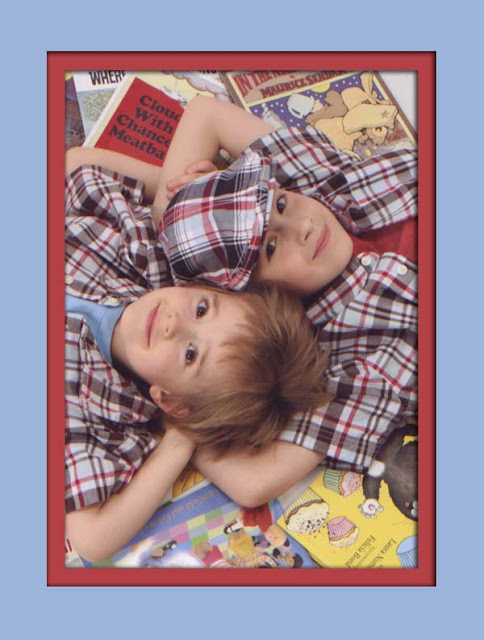 GREAT photo, great books, beautiful kids! This is such a creative shot! I especially like that they are your books. I can just see the boys looking at the picture in about 10 years and saying,"Hey, I remember Mom reading that book to me!" What an awesome photo! So cute :) Thanks for linking up! great shot! And I always love to hear about kids who enjoy reading! What a great shot! I've got to duplicate it in a few years with my little book lovers! The photo turned out great! Glad your books didn't get ruined. My girls have quite a few of those same titles and I would be crushed if they got ruined! You are so creative!! I love how this turned out. Gotta love Gymboree. Those outfits are very handsome. Great pic! And, I'm happy to discover another Dude Mom to add to my list! I absolutely love that photo of them! And I'm so glad books are a big part of your house. Another cute pic! I especially like how Mica loves his hats. BONUS-he looks adorable in them! LOVE the titles and the pic idea! Precious kids! love it! love books and your very cute young men, too! they look sweet! what messy hair? you mean little boys always have neat hair?? I Love it! Total cuteness. A Business Card Giveaway From PrintRunner!